Faith Matters page 28 Irish News Thursday 13th September 2012. 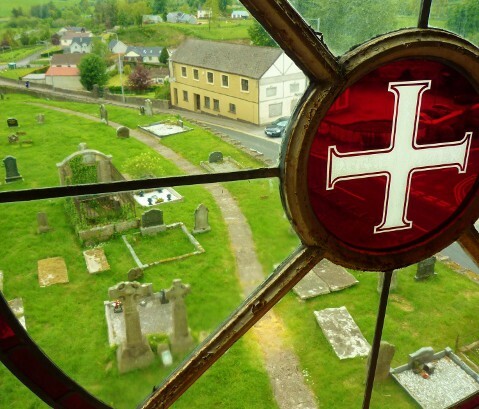 AS THE Poor Clare Order marks its 800th anniversary, a Co Monaghan family has celebrated its own milestone of service to the Catholic Church, writes Michael Fisher. It’s a record of service to the Church in Ireland that must be unique — three priests and three nuns from the same Inniskeen family who between them have achieved more than 350 years in the religious life. Two of the McCluskey family — a priest, Fr Peter, and a nun, Sr Ethna — held their diamond (60) and platinum (70) jubilees respectively earlier this summer at the St Louis Convent in Dundalk. Mass was concelebrated by Fr Peter and their youngest brother, Canon Brian, a priest for 52 years who served in Roslea, Co.Fermanagh and other parishes in the diocese of Clogher. Sr Ethna is a former superior of the St Louis convent in Kilkeel, Co.Down. Patrick Kavanagh was a near neighbour of the McCluskey family at Inniskeen and Canon Brian recalls how the poet used to borrow books from his mother’s private library at the local national school where she taught. Six of the McCluskeys gathered at the convent in Dundalk for the Mass. Fr Peter now lives at Inchicore in Dublin and Sr Ethna at the St Louis Convent in Dundalk. Canon Brian now lives in Belfast with his sister Maire — who used to work for the Northern Ireland orthopaedic service — and celebrated his golden jubilee two years ago. He still says Mass at St Brigid’s Parish in Belfast. They were joined by two other sisters — Una McMahon, a retired nurse living in Belfast, and Sr Nuala, a St Louis nun for 57 years and now retired and living at the convent in Dundalk. Two members of the family, both with 59 years in religious life, were unable to be present. Fr Gerry McCluskey is a Kiltegan priest in Sao Paolo, Brazil. Sr Aileen is a Mercy nun who is in Dublin and, like her brother Fr Gerry, is just one year short of her diamond jubilee. The contribution of the McCluskey family to religious life so far is 357 years — Sr Ethna SSL (70 years); Fr Peter OMI (60); Sr Nuala SSL (57); Fr Gerard SPS (59); Sr Aileen RSM (59); and Canon Brian (52).